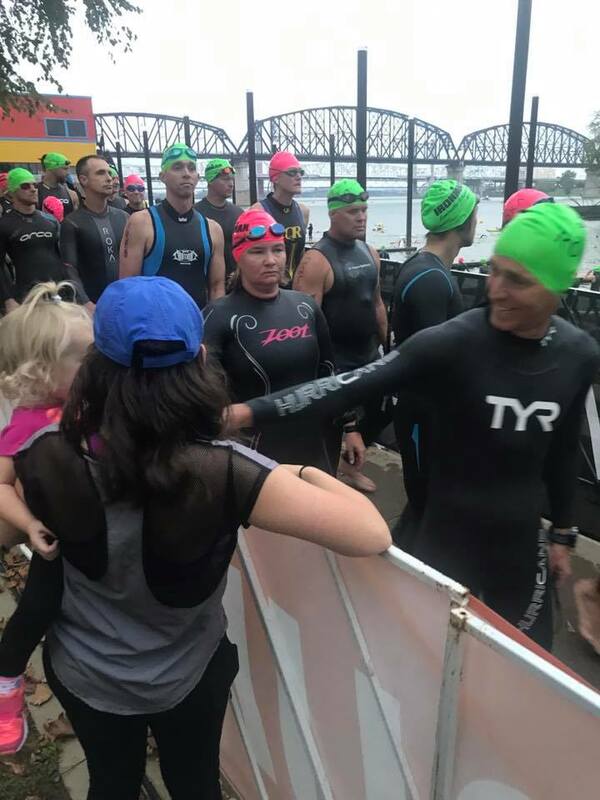 On Sunday, October 15th, 2017 I raced my first full distance Ironman in Louisville Ky with about 2300 other people. I didn't post much about the training leading up to it because quite simply I didn't have the time or energy. So for a quick recap of my training; Training started on May 1st. I am always in marathon shape and haven't needed to build up my long run in years, however, I was basically starting at 0 with the bike and swim. That being the case, my main focus for both was simply building up the specific endurance needed to complete a 2.4 mile swim and a 112 mile bike ride in a reasonable time. The weekly training hours ramped up from 12 to 20 over the course of the cycle. Fast forward to October 15th, 2017 4:00 AM. I slept like a baby and felt good when I woke up for breakfast. I had taken stuff to make peanut butter banana overnight oats. I use this basic recipe from fitfoodies with 2 exceptions; I use real milk and powdered peanut butter. I also had a bagel with jelly and a cup of coffee. After breakfast I loosened up my hips with a yoga routine from the Sufferfest, put on my kit, grabbed my tire pump, nutrition, water bottles, swim gear and headed down to transition for final preparations. I left my family behind in the hotel room with plans to meet near the swim corrals. Walking to transition I was amazed at how calm I was. I got my bike all set up, made my way to body marking, and then on to the swim corrals. I waited around for my family for quite a while and had almost given up on seeing them before the start. Then at what seemed like the last minute, I finally saw them. They came over, we chatted for a few and it was time to start the long walk to the pier where my race would begin. Hannah and Natalie waiting near the swim start. 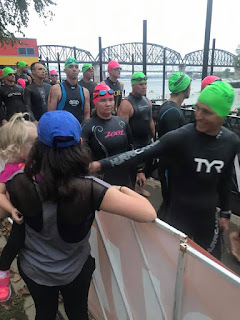 The swim in Louisville is a self seeded corral meaning you line up with a group of swimmers expecting a similar swim time. The fastest swimmers go first with the slower swimmers behind. I was planning to swim 1 hour and 30 minutes and I lined up in the 1:30-1:40 group. It took about 35 minutes for my group to reach the water and jump in. The first 1/3 of the swim is upstream and then you turn and finish downstream. I felt really good in the water from the first strokes. When I raced in Muncie in July I panicked in the water and basically did a breast stroke type dog paddle the entire swim. So to feel good in the water was a huge blessing. There was contact with other swimmers but I just kept plowing forward. I drank some water a few times when I meant to breath but I just kept moving forward. When I made it to the buoy to mark the turn around I looked at my watch to gauge my time but the watch was gone! It had fallen off somewhere in the Ohio river. I started to panic because this watch is not only for swimming, it was the watch that I was racing the whole day with. On the swim it was really just a timer and I wouldn't use it hardly at all. On the bike it was my feedback for power output and on the run I would use it to keep track of my pace.Now, the day would have to be raced solely on perceived effort. Almost as soon as the panic started to over take me by the grace of God, it struck me; this is IRONMAN, adapt and move. I accepted the challenge and got my head back in the race. I still felt good swimming and was clipping along and moving toward the finish which came much quicker than I anticipated. The finish came quicker than anticipated for good reason. It looks as though we had a very strong current on the downstream portion of the swim. According to one piece of analysis, the swim trended 10 minutes faster than the average Louisville IRONMAN swim. I had no idea when I got out of the water because of the lost watch but after the race I would learn that I had swum nearly 15 minutes faster than planned. I'm very mediocre on the bike and the weather was bad. 15-30 MPH winds with gusts of as high as 42 mph. I trained to ride by power and the 920xt is the only display I have for my power meter. The bike would be 100% by effort. I did grab a running watch to use as a timer and to be able to have the gps file when I was done. But between the weather and the hills its only display of speed was no help at all on pacing. The ride out of town was with a nice tail wind and I was cruising 20-22 MPH riding very easy. The course features about a 20 mile ride out to a 35 mile loop that you ride twice and then 20 miles back in. The loop has a lot of rolling hills and a couple of steep climbs. I live in the middle of Indiana so I really had no hills to train on. The first loop went pretty good but the strong winds and the hills started to wear on me on over the course of the second loop. Mary and Hannah came out to the town of La Grange to see me on the bike. On the first loop I heard them and saw them but there wasn't enough time to really acknowledge them. On the second loop, when I came to La Grange I sat up and slowed down so that I could wave and say "Hi." They came all the way out to see me and stood out there for a couple of hours, I figured that was the least I could do. Second loop through La Grange. I ate and drank to plan on the bike taking in about 2000 calories over the course of the ride and about 60 ounces of water. I stopped to pee twice adding about a total of 10 minutes (there was a line both times) to my ride. The first stop was necessary while the second stop was just to "get off the damn bike for a minute" as much as it was for anything else. 6 hours is a long time to be on a bike. Once the 2 loops are complete the course heads back into town. Normally you could expect your average MPH to increase on the ride back since it is downhill. Not on race day though as the ride back into town was into a strong head/crosswind. My legs and back were cramping pretty bad for this part of the ride and I was happy to see the bike dismount line. I handed my bike off to a "bike catcher" and ran to get my run gear. As you can tell from the stats, this is my strength. My running watch only had enough battery to last for the ride so I was now completely without a watch. There was a clock with the race's running time as I headed out of transition. I made note of the time so that I could keep an eye on my pace using the mile marker clocks. Little did I know that even though mile marker clocks are a standard feature in a marathon, they didn't have them in this race. I was running this completely blind. I saw Kasey, Jacob, and Natalie on the run out of transition. Kasey asked me how I felt and I answered honestly. "I feel really good." I couldn't believe how good I felt and as I headed away from downtown I got a lot of "wow, you look really good." and "you look strong" comments from spectators and fellow athletes. I saw Mary and Hannah right around the first mile. By about mile 4 I got a sharp but low intensity pain on the outside of my left knee. The severity of the pain would increase over the course of the run and I would have to fight it the rest of the day. The run is a 2 loop course and Mary, Kasey, Hannah, Natalie and Jacob were all near the half way point waiting for me. When Natalie saw me her face lit up and she started to run toward me. I passed and waved but I only got a few steps past them before I couldn't bear to disappoint Natalie so I stopped, turned around and went back to say hi to her and give her a kiss.Seeing her face when she saw me was truly 1 of a couple of highlights on the day. I asked my family if they had any idea of my pace and since they were tracking me they did, They told me I was running about 7:40. That was exactly the pace I had set as a goal for myself. Just about halfway through the Marathon. Other than my knee I was still feeling pretty strong. I only shared this with my close family but this was about the pace I needed to run a run a Boston Qualifier in the marathon. I honestly thought they were lying to me. I would find out after the race that they were not. Unfortunately, my knee over the second half of the run and just the long day in general began to eat away at that pace. The second half became exponentially harder with each mile and in the last 6 miles I was bargaining with myself between each aid station. Just run to the next aid station and I allowed myself to walk, if I needed to, thru the aid station but did my best to continue running if possible. From mile 23 to mile 26 it got dark. Both the sky and my mind. I wasn't sure if it was actually going to end or not. I just kept focusing on short term goals and by short term I mean the next 30 or 60 seconds. Finally, I was back downtown and nearing the finish line. With about 3 blocks left my friend Matt, who had already finished (9 hours, 47 minutes) was waiting. He started running with me assuring me it was almost over and gave me some really good advice. He told me to make sure I got the finish line to myself. So, when I hit the red carpet, I slowed until the 2 people in front of me crossed and then I took my turn coming thru the chute to hear "Christian High, from Kokomo, IN, You are an IRONMAN"
In that moment the long days melted away and just like that the months of training, the 4:15 AM alarms and 9:00 PM bed times, the 18 hour training weeks, the long grueling bike rides, the "big day" 10 and 12 hour training days, the long runs, the lunch time open water swims paid off and never in my entire life have I felt so satisfied and fulfilled by a personal achievement.